Physicists at Yale University have taken another significant step in the development of quantum computing, a new frontier in computing that promises exponentially faster information processing than the most sophisticated computers of today. (PhysOrg.com) -- Physicists at Yale University have taken another significant step in the development of quantum computing, a new frontier in computing that promises exponentially faster information processing than the most sophisticated computers of today. In research published online this month in the journal Nature, the Yale physicists demonstrate the most basic form of quantum error correction  a way to compensate for quantum computings intrinsic susceptibility to errors. Developing technology to correct these errors on the fly is a necessary step for fully realizing quantum computers. Quantum computers use quantum bits (qubits) to represent information. These qubits can take many forms, such as trapped ions or molecules. At Yale, researchers made their qubits from artificial atoms using superconducting circuits. 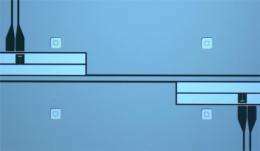 Any qubit must be able to take either of two states, 0 or 1, or both states simultaneously. For quantum computers to work, they must correctly recognize and interpret these qubit states. But qubits are prone to accidental changes of state i.e., errors  confounding interpretation. For the first time, the Yale team has demonstrated quantum error correction in a solid-state system, an electronic device analogous to a computer chip. The team developed a technique for identifying a qubits original state, detecting changes and reversing them when necessary. This result, combined with recent breakthroughs by our lab and others toward making qubits more coherent, shows that superconducting circuits, the system we study here at Yale, may eventually be a platform on which a quantum computer is built, said Robert Schoelkopf, the leader of the research group. Yale researchers, including some involved in the most recent advance, previously developed the worlds first rudimentary solid-state quantum processor, a device that looks and feels like a conventional microprocessor. Other authors of the recent paper are L. DiCarlo of Delft University of Technology in The Netherlands; and S.E Nigg, L. Sun, L. Frunzio and S.M. Girvin, all of Yale University. More information: Read the research paper in Nature. This advance in error correction solves a very big issue. Moore's Law can now be applied "moore" than ever to quantum computing. I couldn't help thinking of a correlation between these molecular corrections to the DNA repair mechanism, which may be operating in quantum states. The abstract is nice. The full article costs $32. Too much for the middle of the Great Depression II. When all else fails, google the title. You wouldn't believe how many papers you can find free elsewhere with just a little bit of work. I'm not a fan of paying so much for articles. The old subscription model for scientific content is outdated. I'm glad that a lot of physicists are publishing their stuff on arXiv, where anyone can view it for free.